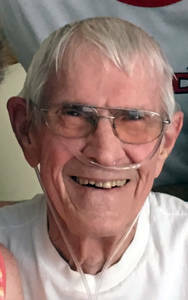 On September 28th Heaven gained an angel as Max R. Hilton (age 82) left his earthly family with Betty, his wife of 62 years, holding his hand and family beside him. Beloved father of Sue Zincke (Pat Milliken), Sandy Grysko (Walt), Debbie Nester (Tim). Cherished grandfather of Walter John, Michael, Max, Joe; Tom, Brad, Shaun, Dave, Brett, and Shelby. Great grandfather of 8. Dearest brother of Chuck, Betsy, Bob and Linda. It was Max’s wishes to be cremated and an intimate family service was held.